QualifiedHardware.com sent me a great post they provided about locking picking. (Original found HERE). Here is what they have to say. You may associate lock-picking with a criminal in a ski mask trying to break into your house. But, the fact of the matter is, lock-picking is not always a criminal activity. You may be in a rush, and you may accidentally lock yourself out of your home or car. Learning how to pick a lock may actually save you time and money (as long as it’s only done on your locks). Many people can’t think of a reason why they would actually need to pick a lock other than breaking into another person’s home. However, there are plenty of reasons why your average, law-respecting citizen familiarizes themselves with the process of lock picking, whether for safety reasons or forgetful, lack-of-caffeine reasons. Lock-picking is a double-edged sword. Although it can be helpful for getting in your own home or car, that means it can also be helpful for intruders getting in your own home or car. Lock picking isn’t as hard as it may seem, which is why you need to make sure the lock on your door is as secure as possible. Lock picking can be prevented by choosing the most secure lock for your home. There are helpful reasons why you would need to pick a lock, but there are also reasons why you should purchase a secure lock to prevent these actions from going any further. We all use locks on our doors because we want to keep our loved ones and possessions safe and secure. However, picking a lock doesn’t take a high degree of skill or effort. Unfortunately, many locks provide the image of security far more readily than they provide actual security. A lock (or many) may make you feel safe, but that doesn’t mean it can’t be broken. Learning how to pick a lock yourself may make you realize that you can’t only trust a lock to keep up a satisfactory degree of security. When people learn more about lock picking, they become aware of the illusion of safety. Discovering this illusion is both harrowing and, in a strange way, inspiring. Harrowing, because it makes people realize that only a thin line exists between a safe home and an eager intruder, but inspiring because it makes people realize the need to find the best lock possible for their home. Although the best lock may be a moral one, but that’s not always going to stop a trespasser. Furthermore, learning how to pick a lock is a skill-set many wish they had in times of emergency. If you’ve ever locked your keys in your car, or accidentally locked yourself out of your home, you know how frustrating it is to wait around for the key or a locksmith. Wouldn’t you love to just be able to let yourself back in without worrying about a professional? Many different kinds of tools exist to help one pick a lock. Most states actually allow anyone to own and carry lock picking tools, as long as they are being used on a person’s own lock. Some states, however, consider lock picking kits as evidence of premeditated criminal activity. In these particular states, you need to explain why you have the kit and what its purpose serves. Lock picking actually can save a life (or lives). One company that empowers individuals with threat-prevent skills, ITS (Imminent Threat Solutions) Tactical, notes that there have been instances in which a person went into a nonresponsive, elderly parent’s home through the use of lock picking to discover the parent was injured and couldn’t reach the phone. Picking a lock only takes a moment and doesn’t leave any damage that could result from alternative methods, such as breaking down a door. 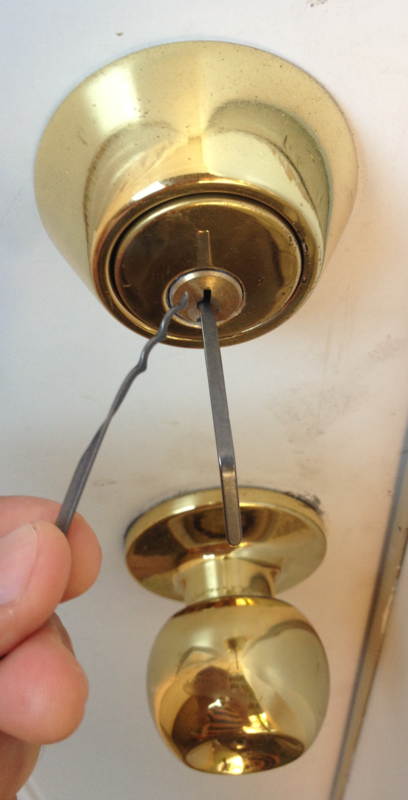 The legality behind lock picking really depends on the circumstance surrounding your need to break into a home. At its core, lock picking is puzzle-solving. While solutions vary, a person’s approach to puzzle-solving is always the same. Indeed, the methods used to pick locks hasn’t changed much since the lock was invented. Once you handle the component pieces in just the right way, any lock will yield as surely as if you were using a key. The easiest way to open a lock is, of course, to use the appropriate key, but this is far from the only option. When you approach the task of picking a lock, you’re essentially trying to recreate the effect of a key in its absence. First, you’ll need a lock you can use for practice. You can pick up any cheap, key-use lock from a hardware store to begin. You’ll also need tools. Professional locksmiths use a pick and a torque, but you can also practice with non-traditional tools, such as bobby pins and paper clips. Any metal piece that will fit into the lock with enough give to bend, without completely warping, will suffice. Before you begin putting together a puzzle, you must understand how the component pieces work. 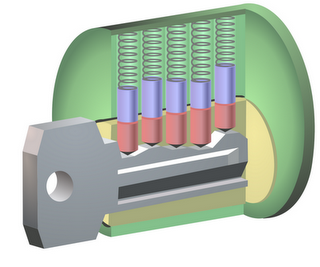 The primary parts of pin-tumbler lock, the one you are probably most familiar with, are the plug and the body. These are the parts of the lock that are visible on the outside. The plug is the cylindrical part of the lock that turns when you rotate the key, and the body is the container that houses the locking mechanism. If these parts were the only parts of a lock, the lock would be useless. Any key would work to open the door. Lock designers, however, add an element to the turning mechanism that uses the intersecting area between the plug and the lock’s body. This may make it seem harder to pick a lock, but it is still possible. Locks are made to act as a security measure, so they are inherently difficult to pick. Even professional locksmith tools can falter. If you don’t understand how locks work, picking them is even harder. Before further learning about picking a lock you need to learn about the basic anatomy of one. The locks you’re probably most familiar with are “pin tumblers locks,” or “Yale” locks. These locks use a set of metal bars called pins, and the lengths vary to prevent the lock from being opened by the incorrect key. The part that the key enters is called the “keyway,” and it is housed inside the “plug.” The plug is the part that needs to rotate to turn the door handle. You don’t have to be an stealthy hacker to learn how to pick a lock. In fact, you probably have some appropriate tools located in your own home. Straighten the bobby pin out flat. Do not snap it in half. You want to leave enough of the pin sticking out of the lock so that it doesn’t get stuck. Remove the rubber coated tips, if it has any. Some pins do, some don’t. You can use pliers, wire cutters, or even your fingernails for this part. Your pin should be flat and smooth with no ornamentation so take off anything extra. Insert the pin into the lock, but only slightly – maybe one or two centimeters. Bend your pin back so that the tip now bends at a right angle. Curl the other end of the pin around your index finger. This makes the pin easier to grip. Take a second bobby pin and bend it into a right angle. This will work as a lever later. Insert your lever into the lock. Begin to turn it the direction you normally would in order to open the door. Do not snap and break your pin – just use gentle pressure. Insert the pin with the bent tip into the lock as well. Begin to feel for the pins by moving them up and down with your hair pin. If the pins don’t move, lessen up on the pressure on your lever. Push the pins until they “click” into place. You should feel for the pin that is resisting you and move it up with the bent tip of your pick. Similar to the bobby pin, the paper clip has the ability to be used as a pick but requirements some adjustments (and may be a bit cumbersome to handle in real-life). The challenge with paper clips is making sure they don’t bend too much once you begin trying to pick the lock with them. They are often made of softer metal than hair pins, so use a gentle touch. It is possible to purchase lock pick sets to assist you in your endeavors. These are perfectly legal to own and just serve to show that no lock is off-limits. The sets aren’t even very expensive – most run for less than forty dollars at your local home improvement store. “Jack-knife” style sets are popular – they include several different picks on one device, like a Swiss army knife. Electronic picks, also known as “pick guns,” or “snap guns,” are also on the market. They move all of the pins at the same time and make quick work of the lock picking. They run anywhere from twenty-five to over fifty dollars. Now that you know the little work that goes into picking a lock, you need to know how you can prevent an issue from occurring in your own home. Lock-picking may be easy for some to perform, but luckily, there are certain preventative measures that you can take. Knowing the type of lock you need is crucial. The type of lock is crucial when trying to find the most secure lock option for yourself and your family to avoid lock picking from an intruder. There are three styles of deadbolt locks: single cylinder, double cylinder, and lockable thumbturn locks. Single cylinder deadbolts are a more common but less secure style of deadbolt. These deadbolts require a key to open the door from the outside but do not require a key to lock or unlock from the inside. The door is locked or unlocked using a thumbturn style lever. Double cylinder deadbolts are a more secure but less common type of lock. These locks require a key to open the door both inside and outside the house. There is no thumb-turn style lever on a double-cylinder lock. Though more secure than single cylinder deadbolts, double cylinder locks can be dangerous in situations where a key is not readily found or available. Lockable Thumbturn deadbolts are a hybrid between double-cylinder deadbolts and single-cylinder deadbolts. These deadbolts have thumb turns on the inside, but the thumb turn can actually be locked or unlocked on the inside. Deadbolts are Â almost used on external doors, leading to the front of your house. Deadbolts are the most secure style of lock and are crucial to have as the main lock on your front door. Knob Locks are common locks for residential settings, in addition to deadbolts on the exterior of a home. Mortise cylinder locks are often found found in glass entry doors and commercial doors. A mortise lock is a lock placed within the body of the door, as opposed to the surface. These are commonly used as storm doors and are more convenient and practical than secure. Keyless locks are convenient because you don’t need to spend time looking for your keys or making copies for family or close friends. You just need to enter a code and you are let inside. Keyless locks have both positives and negatives. Hackers can access or guess the code, but they also don’t have to directly pick any locks, so it may be harder for them to enter. Lock picking is one of the oldest (and simplest) ways that intruders have been breaking into homes. There are a number of approaches to lock picking, and the quality of your tools may vary from professional-grade materials to anything lying around your home. A simple bobby pin is enough to pick a lock. Luckily, you can choose to protect yourself from unsolicited guests by purchasing commercial grade locks and utilizing commercial grade doors, which are the trusted enemy of lock pickers. Though no lock is 100% pick-proof, these are more secure locks that you should choose for the safety and comfort of your family in your home. Knowing how to pick a lock isn’t rocket science; knowing how to prevent a lock-pick is imperative. Had a great experience at your post!!! Nowadays, our house or office is not safe so while choosing a safety door locks everyone should keep all thing in their mind like- door locks specifications, reliability etc. Thanks for sharing this post with us…….